NEW YORK, NY – October 30, 2009 – (RealEstateRama) — Today NYC Development Corporation (HDC) President Marc Jahr, Bronx Borough President Ruben Diaz, Jr. and Vincent Riso from the Briarwood Organization were joined by Daniel Martin from the Housing Partnership Development Corporation, Marian Zucker, Executive Vice President of the New York State Affordable Housing Corporation Fund (AHC) to celebrate the grand opening of The Solara, also known as Grant Avenue Co-op Apartments. The creation of affordable housing in neighborhoods across New York City is part of the City’s Five Borough Economic Opportunity Plan to create jobs for New Yorkers today; and implement a vision for long-term economic growth resulting in affordable, attractive neighborhoods. Part of Mayor Michael R. Bloomberg’s ambitious New Housing Marketplace plan to create of preserve 165,000 homes by 2014, The Solara, located on Grant Avenue between 167th and 169th in the East Concourse section in the Bronx, consists of two newly constructed residential buildings with a total of 162 units with on-site parking. Built as part of HDC’s Affordable Cooperative Housing Program, they are the first mid-rise residential structures in Community Board #4 to offer cooperative homeownership units. Construction activity employed 324 people. The Solara’s total development cost of $49.3 million was funded through a variety of programs. HDC provided a $19.3 million construction loan and $250,000 in permanent financing, the Housing Partnership Development Corporation and the AHC contributed $6.2 million to restrict eligible income levels up to 80% of the AMI ($61,450 for a family of four), the Bronx Borough President’s Office committed a grant of $2.1 million, the Housing Trust Fund (HTF), as a subsidiary public benefit corporation of the New York State Housing Finance Agency (HFA), contributed $5 million and the NYC Housing Preservation and Development (HPD) provided $1 million in HOME funds . “We are excited about the affordable homeownership opportunities for District 16 residents. This building can be the economic stimulus in our community that will result in many residents being able to capture this American dream,” said Councilmember Helen Diane Foster. Briarwood Properties, Inc., the managing agent for the Solara, received 4,516 applications for the 160 available units (total is 162, two units are for the two live-in superintendents). “Ever since I was a teenager, I have always dreamed of owning a home,” said Denise Mariso, a Solara buyer. “Five years ago, I set a goal to buy a home by 2010 and began the journey that brought me here today. Thanks to my hard-earned savings and the subsidies that went into The Solara, I am now the proud owner of a two-bedroom co-op.” As of today, 152 of the 162 units have been sold. Families with incomes ranging from 78% to 102% of Area Median Income (AMI) are eligible to purchase an apartment in the Solara. There are 18 one-bedroom units for households earning up to 78% AMI ($59,904 for a family of four); 34 two-bedroom units for families earning up to 79% AMI ($60,672 for a family of four); 70 two-bedroom units with an income limit of up to 80% AMI ($61,450 for a family of four); and 36 three-bedroom units for families making up to 102% AMI ($78,336 for a family of four). 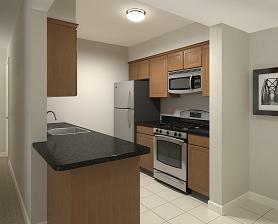 The project also includes two two-bedroom superintendent units, one for each building. The New York City Housing Development Corporation (HDC) provides a variety of financing programs for the creation and preservation of multi-family affordable housing throughout the five boroughs of New York City. Our programs are designed to meet the wide-range of affordable housing needs of the City’s economically diverse population. In partnership with the NYC Department of Housing Preservation & Development, HDC works to implement out Mayor Michael R. Bloomberg’s New Housing Marketplace plan to create of preserve 165,000 affordable housing units by 2014. Since the plan launched in 2004, HDC financed more than 43,000 homes for low- , moderate- and middle-income New Yorkers. 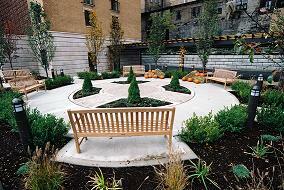 The New York City Housing Development Corporation is rated AA by S&P and Aa2 by Moody’s. HPD is the nation’s largest municipal housing preservation and development agency. 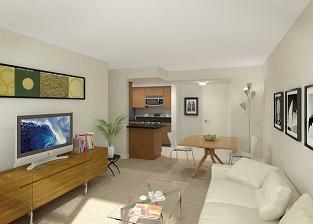 Its mission is to promote quality housing and viable neighborhoods for New Yorkers. 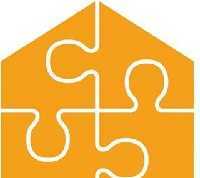 It is responsible for implementing Mayor Bloomberg’s New Housing Marketplace Plan to build and preserve 165,000 units of affordable housing by 2014. Since the plan’s inception, more than 94,000 affordable homes have been created or preserved. HPD also actively promotes the preservation of affordable housing through education, outreach, loan programs and enforcement of housing quality standards. For more information, visit www.nyc.gov/hpd. Dedicated to providing “the total real estate experience,” The Briarwood Organization offers a full complement of development, construction, sales and property management services. Since its inception in 1912, the company has completed thousands of affordable and market-rate residential units and over 100,000 square feet of commercial space – consistently winning civic, design and construction awards. These projects have ushered waves of prosperity throughout New York City and currently represent a market value of over a billion dollars. Over the past 40 years, Briarwood has focused its expertise and resources on making home ownership possible for New Yorkers unable to keep pace with city’s skyrocketing housing prices. The company’s affordable housing has played a major role in the revitalization of neighborhoods like the South Bronx, East New York, the Rockaways and East Harlem. For more information on Briarwood visit www.briarwoodorg.com. 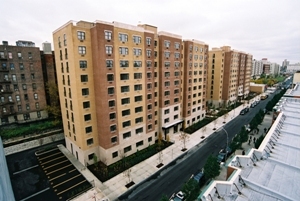 The Housing Partnership Development Corporation has sponsored the development of more than 17,500 homes in the five boroughs of New York City since 1982. The Housing Partnership’s efforts in homeownership have spurred community revitalization and private investment valued at more than $1.5 billion. Thousands of city-owned vacant properties–once neighborhood eyesores–have been transformed into vibrant communities for working New Yorkers. The Housing Partnership has worked in partnership with public agencies, developers, lenders, nonprofit community groups and homebuyers, to help transform the landscape of New York City. The New York State Affordable Housing Corporation (“AHC”) is a public benefit corporation, established in 1985 pursuant to Section 45-b of the Private Housing Finance Law (“PHFL”) as a subsidiary of the New York State Housing Finance Agency (“HFA”), to administer the Affordable Home Ownership Development Program (“Program”) under PHFL Article 19. The purpose of the Program is to promote homeownership by persons of low and moderate income, which, in turn, fosters the development, stabilization and preservation of neighborhoods and communities. To achieve these goals, AHC provides financial assistance, in conjunction with other private and public investment, for the construction, acquisition, rehabilitation and improvement of owner-occupied housing. The Five Borough Economic Opportunity Plan is a comprehensive strategy to bring New York City through the current economic downturn as fast as possible. It focuses on three major areas: creating jobs for New Yorkers today, implementing a long-term vision for growing the city’s economy, and building affordable, attractive neighborhoods in every borough. Taken together, the initiatives that the City has launched to achieve these goals will generate thousands of jobs and put New York City on a path to economic recovery and growth.